The Hamilton County Board of Health, Health Commissioner Tim Ingram, and Ohio Representative Louis Terhar. HAMILTON COUNTY, OHIO – Hamilton County Board of Health completed its annual reorganization, electing Kenneth Amend, M.D. of Green Township as president of the board and electing Mark Rippe, Indian Hill as vice president. Board member Jim Brett of Whitewater Township was reappointed to a new, five-year term by the Hamilton County District Advisory Council. 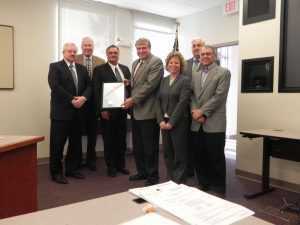 The District Advisory Council is made up of presidents of the township boards of trustees, village mayors and the president of the Board of County Commissioners. The five-member Board of Health is the governing body of Hamilton County Public Health. In addition to Amend, Brett and Rippe, board members include Thomas Chatham of Green Township and Tracey A. Puthoff, Esq. of Anderson. The Board has the authority to adopt public health rules and regulations, which have the same status as law, and to enact policies within Hamilton County Public Health’s jurisdiction. The Board of Health’s regular meeting schedule through March 2018 will be on the second Monday of each month at 6:30 p.m. at Hamilton County Public Health, 250 William Howard Taft, in Cincinnati. All meetings are open to the public.